Technically, this waterfall is not located in a park or preserve — but it’s a really beautiful place 14 miles east of Fort Bragg off Highway 20, out in the middle of the Jackson Demonstration State Forest. At M17.4 by the Dunlap Conservation Camp, turn left onto Road 200, just past (east of) the Chamberlain Creek bridge. (Right before you come to the bridge, you’ll see a large parking lot on the right, with an old steam donkey on display.) The unpaved road splits in 1.2 miles, and you take a sharp left to follow Road 200 as it climbs. When you are 4.7 miles from Highway 20, you’ll reach a parking area on the left with stairs. Descend steep stairs (about 50 steps, with good railings), and follow the path as it descends into a canyon. 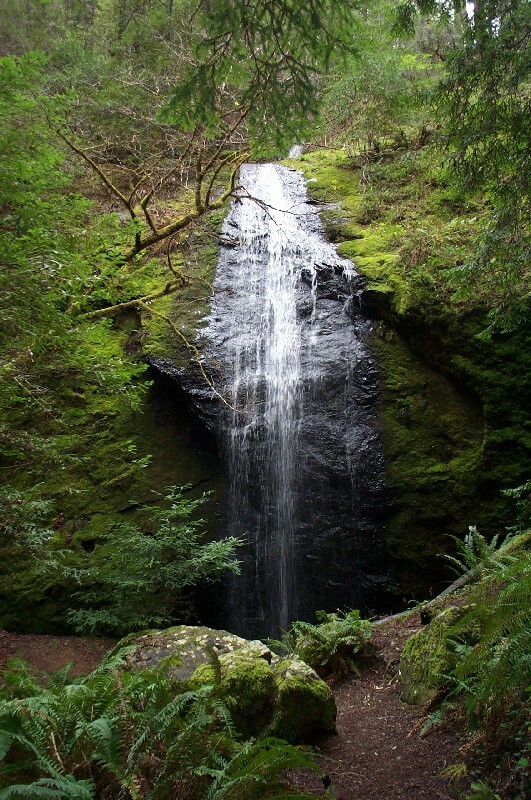 The 50-foot waterfall is 1/3 mile along the trail. Continue past the waterfall into a thin, deep canyon containing virgin redwoods that escaped the cuts. Follow the trail up to the right to see the trees from higher up, and you can continue up the trail above the waterfall to the road, just 3/10 mile north of the parking lot. It’s easiest to return the way you came in, though. Note: After you leave Highway 20, you’re on a fairly well maintained dirt road. In dry weather, this road is accessible to any modern passenger car, as long as you return the way you went in. Access: go 8 miles north on Highway One, then head east on Highway 20 for 17 miles to the Dunlap Conservation Camp. 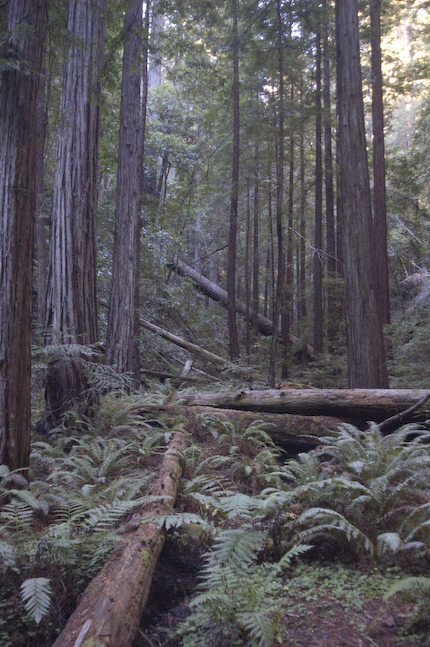 Time & Distance: 1 hour; ½ mile to waterfall and virgin redwoods. Alternate Route: After you return to your car from the waterfall, continue up the road for 3/10 mile to the intersection. Go right (east) on Road 1000, dividing the Noyo River and Big River watersheds, for one mile, and then go right on Road 240. Road 240 rejoins Road 200 at the third wooden bridge from Highway 20 – make sure the bottom gate is open for Road 240. You’ll need a high-clearance vehicle for Road 240, and this entire route can be impassable for all vehicles in wet weather.